Not to be confused with Decertification or Desertion. 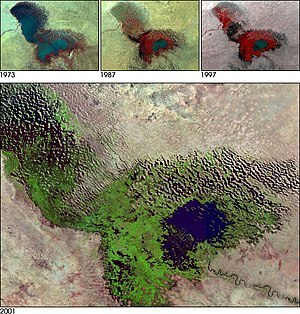 Lake Chad in a 2001 satellite image, with the actual lake in blue. The lake has shrunk by 94% since the 1960s. Desertification is a type of land degradation in which a relatively dry area of land becomes a desert, typically losing its bodies of water as well as vegetation and wildlife. It is caused by a variety of factors, such as through climate change (particularly the current global warming) and through the overexploitation of soil through human activity. When deserts appear automatically over the natural course of a planet's life cycle, then it can be called a natural phenomenon; however, when deserts emerge due to the rampant and unchecked depletion of nutrients in soil that are essential for it to remain arable, then a virtual "soil death" can be spoken of, which traces its cause back to human overexploitation. Desertification is a significant global ecological and environmental problem with far reaching consequences on socio-economic and political conditions. 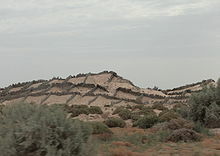 Considerable controversy exists over the proper definition of the term "desertification" for which Helmut Geist (2005) has identified more than 100 formal definitions. The most widely accepted of these is that of the Princeton University Dictionary which defines it as "the process of fertile land transforming into desert typically as a result of deforestation, drought or improper/inappropriate agriculture". Desertification has been neatly defined in the text of the United Nations Convention to Combat Desertification (UNCCD) as "land degradation in arid, semi-arid and dry sub-humid regions resulting from various factors, including climatic variations and human activities." Another major contribution to the controversy comes from the sub-grouping of types of desertification. Spanning from the very vague yet shortsighted view as the "man-made-desert" to the broader yet less focused type as the "Non-pattern-Desert". The earliest known discussion of the topic arose soon after the French colonization of West Africa, when the Comité d'Etudes commissioned a study on desséchement progressif to explore the prehistoric expansion of the Sahara Desert. The world's most noted deserts have been formed by natural processes interacting over long intervals of time. During most of these times, deserts have grown and shrunk independent of human activities. Paleodeserts are large sand seas now inactive because they are stabilized by vegetation, some extending beyond the present margins of core deserts, such as the Sahara, the largest hot desert. Drylands occupy approximately 40–41% of Earth’s land area and are home to more than 2 billion people. It has been estimated that some 10–20% of drylands are already degraded, the total area affected by desertification being between 6 and 12 million square kilometres, that about 1–6% of the inhabitants of drylands live in desertified areas, and that a billion people are under threat from further desertification. As of 1998, the then-current degree of southward expansion of the Sahara was not well known, due to a lack of recent, measurable expansion of the desert into the Sahel at the time. The impact of global warming and human activities are presented in the Sahel. In this area, the level of desertification is very high compared to other areas in the world. All areas situated in the eastern part of Africa (i.e. in the Sahel region) are characterized by a dry climate, hot temperatures, and low rainfall (300–750 mm rainfall per year). So, droughts are the rule in the Sahel region. Some studies have shown that Africa has lost approximately 650,000 km² of its productive agricultural land over the past 50 years. The propagation of desertification in this area is considerable. Some statistics have shown that since 1900 the Sahara has expanded by 250 km to the south over a stretch of land from west to east 6,000 km long. The survey, done by the research institute for development, had demonstrated that this means dryness is spreading fast in the Sahelian countries. 70% of the arid area has deteriorated and water resources have disappeared, leading to soil degradation. 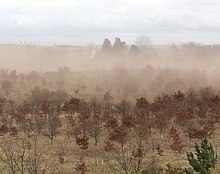 The loss of topsoil means that plants cannot take root firmly and can be uprooted by torrential water or strong winds. The United Nations Convention (UNC) says that about six million Sahelian citizens would have to give up the desertified zones of sub-Saharan Africa for North Africa and Europe between 1997 and 2020. Another major area that is being impacted by desertification is the Gobi Desert. Currently, the Gobi desert is the fastest moving desert on Earth; according to some researchers, the Gobi Desert swallows up over 1,300 square miles (3,370 km²) of land annually. This has destroyed many villages in its path. Currently, photos show that the Gobi Desert has expanded to the point the entire nation of Croatia could fit inside its area. This is causing a major problem for the people of China. They will soon have to deal with the desert as it creeps closer. Although the Gobi Desert itself is still a distance away from Beijing, reports from field studies state there are large sand dunes forming only 70 km (43.5 mi) outside the city. As the desertification takes place, the landscape may progress through different stages and continuously transform in appearance. On gradually sloped terrain, desertification can create increasingly larger empty spaces over a large strip of land, a phenomenon known as "Brousse tigrée". A mathematical model of this phenomenon proposed by C. Klausmeier attributes this patterning to dynamics in plant-water interaction. One outcome of this observation suggests an optimal planting strategy for agriculture in arid environments. Goats inside of a pen in Norte Chico, Chile. Overgrazing of drylands by poorly managed traditional herding is one of the primary causes of desertification. The immediate cause is the loss of most vegetation. This is driven by a number of factors, alone or in combination, such as drought, climatic shifts, tillage for agriculture, overgrazing and deforestation for fuel or construction materials. Vegetation plays a major role in determining the biological composition of the soil. Studies have shown that, in many environments, the rate of erosion and runoff decreases exponentially with increased vegetation cover. Unprotected, dry soil surfaces blow away with the wind or are washed away by flash floods, leaving infertile lower soil layers that bake in the sun and become an unproductive hardpan. Many scientists think that one of the most common causes is overgrazing, too much consumption of vegetation by cattle. Controversially, Allan Savory has claimed that the controlled movement of herds of livestock, mimicking herds of grazing wildlife, can reverse desertification. Scientists agree, that there is a natural cause for the existence of desert in the place where is now the Sahara desert: a natural climate cycle cause a lack of water in this area from time to time. There is a suggestion that the last time that the Sahara was converted from savanna to desert it was partially due to overgrazing by the cattle of the local population. At least 90% of the inhabitants of drylands live in developing countries, where they also suffer from poor economic and social conditions. This situation is exacerbated by land degradation because of the reduction in productivity, the precariousness of living conditions and the difficulty of access to resources and opportunities. A downward spiral is created in many underdeveloped countries by overgrazing, land exhaustion and overdrafting of groundwater in many of the marginally productive world regions due to overpopulation pressures to exploit marginal drylands for farming. Decision-makers are understandably averse to invest in arid zones with low potential. This absence of investment contributes to the marginalisation of these zones. When unfavourable agro-climatic conditions are combined with an absence of infrastructure and access to markets, as well as poorly adapted production techniques and an underfed and undereducated population, most such zones are excluded from development. Desertification often causes rural lands to become unable to support the same sized populations that previously lived there. This results in mass migrations out of rural areas and into urban areas, particularly in Africa. These migrations into the cities often cause large numbers of unemployed people, who end up living in slums. Agriculture is a main source of income for many desert communities. The increase in desertification in theses regions has degraded the land enough where people can no longer productively farm and make a profit. This has negatively impacted the economy and increased poverty rates. 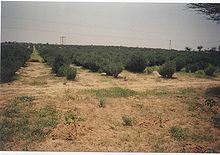 Jojoba plantations, such as those shown, have played a role in combating edge effects of desertification in the Thar Desert, India. Techniques and countermeasures exist for mitigating or reversing the effects of desertification, and some possess varying levels of difficulty. For some, there are numerous barriers to their implementation. Yet for others, the solution simply requires the exercise of human reason. One proposed barrier is that the costs of adopting sustainable agricultural practices sometimes exceed the benefits for individual farmers, even while they are socially and environmentally beneficial. Another issue is a lack of political will, and lack of funding to support land reclamation and anti-desertification programs. Desertification is recognized as a major threat to biodiversity. Some countries have developed Biodiversity Action Plans to counter its effects, particularly in relation to the protection of endangered flora and fauna. Reforestation gets at one of the root causes of desertification and is not just a treatment of the symptoms. Environmental organizations work in places where deforestation and desertification are contributing to extreme poverty. There they focus primarily on educating the local population about the dangers of deforestation and sometimes employ them to grow seedlings, which they transfer to severely deforested areas during the rainy season. The Food and Agriculture Organization of the United Nations launched the FAO Drylands Restoration Initiative in 2012 to draw together knowledge and experience on dryland restoration. In 2015, FAO published global guidelines for the restoration of degraded forests and landscapes in drylands, in collaboration with the Turkish Ministry of Forestry and Water Affairs and the Turkish Cooperation and Coordination Agency. The Green Wall of China is a high-profile example of one method that has been finding success in this battle with desertification. [according to whom?]. This wall is a much larger-scale version of what American farmers did in the 1930s to stop the great Midwest dust bowl. This plan was proposed in the late 1970s, and has become a major ecological engineering project that is not predicted to end until the year 2055. According to Chinese reports, there have been nearly 66,000,000,000 trees planted in China's great green wall. Due to the success that China has been finding in stopping the spread of desertification, plans are currently be made in Africa to start a "wall" along the borders of the Sahara desert as well to be financed by the United Nation's Global Environment Facility trust. Techniques focus on two aspects: provisioning of water, and fixation and hyper-fertilizing soil. Fixating the soil is often done through the use of shelter belts, woodlots and windbreaks. Windbreaks are made from trees and bushes and are used to reduce soil erosion and evapotranspiration. They were widely encouraged by development agencies from the middle of the 1980s in the Sahel area of Africa. Some soils (for example, clay), due to lack of water can become consolidated rather than porous (as in the case of sandy soils). Some techniques as zaï or tillage are then used to still allow the planting of crops. Waffle gardens can also help as they can provide protection of the plants against wind/sandblasting, and increase the hours of shade falling on the plant. Another technique that is useful is contour trenching. This involves the digging of 150 m long, 1 m deep trenches in the soil. The trenches are made parallel to the height lines of the landscape, preventing the water from flowing within the trenches and causing erosion. Stone walls are placed around the trenches to prevent the trenches from closing up again. The method was invented by Peter Westerveld. Enriching of the soil and restoration of its fertility is often done by plants. Of these, leguminous plants which extract nitrogen from the air and fix it in the soil, and food crops/trees as grains, barley, beans and dates are the most important. Sand fences can also be used to control drifting of soil and sand erosion. Some research centra (such as Bel-Air Research Center IRD/ISRA/UCAD) are also experimenting with the inoculation of tree species with mycorrhiza in arid zones. The mycorrhiza are basically fungi attaching themselves to the roots of the plants. They hereby create a symbiotic relation with the trees, increasing the surface area of the tree's roots greatly (allowing the tree to gather much more nutrients from the soil). As there are many different types of deserts, there are also different types of desert reclamation methodologies. An example for this is the salt-flats in the Rub' al Khali desert in Saudi-Arabia. These salt-flats are one of the most promising desert areas for seawater agriculture and could be revitalized without the use of freshwater or much energy. Farmer-managed natural regeneration (FMNR) is another technique that has produced successful results for desert reclamation. Since 1980, this method to reforest degraded landscape has been applied with some success in Niger. This simple and low-cost method has enabled farmers to regenerate some 30,000 square kilometers in Niger. The process involves enabling native sprouting tree growth through selective pruning of shrub shoots. The residue from pruned trees can be used to provide mulching for fields thus increasing soil water retention and reducing evaporation. Additionally, properly spaced and pruned trees can increase crop yields. The Humbo Assisted Regeneration Project which uses FMNR techniques in Ethiopia has received money from The World Bank’s BioCarbon Fund, which supports projects that sequester or conserve carbon in forests or agricultural ecosystems. It is argued that managed grazing methods are able to restore grasslands. Restoring grasslands store CO2 from the air into plant material. 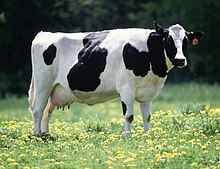 Grazing livestock, usually not left to wander, would eat the grass and would minimize any grass growth while grass left alone would eventually grow to cover its own growing buds, preventing them from photosynthesizing and killing the plant. A method proposed to restore grasslands uses fences with many small paddocks and moving herds from one paddock to another after a day or two in order to mimic natural grazers and allowing the grass to grow optimally. It is estimated that increasing the carbon content of the soils in the world’s 3.5 billion hectares of agricultural grassland would offset nearly 12 years of CO2 emissions. Allan Savory, as part of holistic management, claims that while large herds are often blamed for desertification, prehistoric lands used to support large or larger herds and areas where herds were removed in the United States are still desertifying; range scientists have however not been able to experimentally confirm his claims. ^ Mayell, Hillary (April 26, 2001). "Shrinking African Lake Offers Lesson on Finite Resources". National Geographic News. Retrieved 20 June 2011. ^ a b Zeng, Ning; Yoon, Jinho (1 September 2009). "Expansion of the world's deserts due to vegetation-albedo feedback under global warming". Geophysical Research Letters. 36 (17): L17401. Bibcode:2009GeoRL..3617401Z. doi:10.1029/2009GL039699. ISSN 1944-8007. ^ "Sustainable development of drylands and combating desertification". Retrieved 21 June 2016. ^ "The Desert Will Win". FIGU-Landesgruppe Canada. Retrieved 2017-01-02. 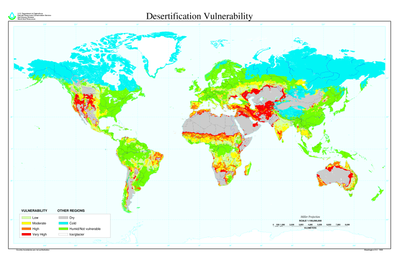 ^ "define:desertification – Google Search". Retrieved 21 June 2016. ^ "Part I". Retrieved 21 June 2016. ^ Helmut J. Geist, and Eric F. Lambin. "Dynamic Causal Patterns of Desertification." BioScience 54.9 (2004): 817 . Web. ^ Mortimore, Michael (1989). Adapting to drought: farmers, famines, and desertification in West Africa. Cambridge University Press. p. 12. ISBN 978-0-521-32312-3. ^ a b LOWDERMILK, W C. "CONQUEST OF THE LAND THROUGH SEVEN THOUSAND YEARS" (PDF). Soil Conservation Service. United States Department of Agriculture. Retrieved 9 April 2014. ^ Whitford, Walter G. (2002). Ecology of desert systems. Academic Press. p. 277. ISBN 978-0-12-747261-4. ^ Geist, Helmut (2005). The causes and progression of desertification. Antony Rowe Ltd. Ashgate publishing limited. ISBN 9780754643234. Retrieved 6 July 2013. ^ Dregne, H.E. "Desertification of Arid Lands". Columbia University. Retrieved 3 December 2013. ^ "Sun, Moon and Telescopes above the Desert". ESO Picture of the Week. Retrieved 30 April 2012. ^ a b "UNCCD – Error 404 – Page Not Found" (PDF). Retrieved 21 June 2016. ^ World Bank (2009). Gender in agriculture sourcebook. World Bank Publications. p. 454. ISBN 978-0-8213-7587-7. ^ "IRI – International Research Institute for Climate and Society" (PDF). ^ Riebeek, Holli (2007-01-03). "Defining Desertification : Feature Articles". earthobservatory.nasa.gov. Retrieved 2016-11-30. ^ a b c "La progression du désert du Sahara augmente chaque année ?". Savezvousque.fr. Retrieved 2016-11-30. ^ Hecke, Geoffrey Van (2012). Humanum 3, le secret d'Épidaure: suivi de Amazone City. Mon Petit Éditeur. p. 192. ISBN 978-2-7483-9214-2. D'après Monique Mainguet, depuis 1900, le Sahara a progressé vers le sud de 250 kilomètres et ce sur un front qui en fait plus de 6000 km. ^ Christian Bouquet (December 2017). "Le Sahara entre ses deux rives. Éléments de délimitation par la géohistoire d'un espace de contraintes". Géoconfluences. Mais il aurait progressé de 250 km vers le sud depuis 1900 (Mainguet, 2003), et dépasserait donc 9 millions de km² soit 30 % de la superficie totale du continent africain. ^ Mainguet, Monique (2003). Les pays secs: environnement et développement. Ellipses. ^ a b "United Nations Convention to Combat Desertification: Issues and Challenges". E-International Relations. Retrieved 2016-11-30. ^ "Living in China's Expanding Deserts". The New York Times. 2016-10-24. ^ Klausmeier, Christopher (1999). "Regular and irregular patterns in semiarid vegetation". Science. 284 (5421): 1826–1828. doi:10.1126/science.284.5421.1826. ^ (www.dw.com), Deutsche Welle. "Grid of straw squares turns Chinese sand to soil – Environment – DW.COM – 23.06.2011". Retrieved 21 June 2016. ^ Laduke, Winona (1999). All Our Relations: Native Struggles for Land and Life (PDF). Cambridge, MA: South End Press. p. 146. ISBN 978-0896085992. Archived from the original (PDF) on 2 April 2015. Retrieved 30 March 2015. ^ Duval, Clay. "Bison Conservation: Saving an Ecologically and Culturally Keystone Species" (PDF). Duke University. Archived from the original (PDF) on March 8, 2012. Retrieved April 13, 2015. ^ Geeson, Nichola; et al. (2002). Mediterranean desertification: a mosaic of processes and responses. John Wiley & Sons. p. 58. ISBN 978-0-470-84448-9. ^ Savory, Allan. "Allan Savory: How to green the world's deserts and reverse climate change". ^ Savory, Allan. "Holistic resource management: a conceptual framework for ecologically sound economic modelling" (PDF). Ecological Economics. Elsevier Science Publishers. Archived from the original (PDF) on 23 May 2013. Retrieved 10 March 2013. ^ Butterfield, Jody (2006). Holistic Management Handbook: Healthy Land, Healthy Profits, Second Edition. Island Press. ISBN 978-1559638852. ^ Savory, Allan. "Response to request for information on the "science" and "methodology" underpinning Holistic Management and holistic planned grazing" (PDF). Savory Institute. Archived from the original (PDF) on 23 May 2013. Retrieved 10 March 2013. ^ Drury, Steve (2012-04-13). "Large-animal extinction in Australia linked to human hunters". Earth-Pages. Retrieved 9 June 2014. ^ K. Wright, David; Rull, Valenti; Roberts, Richard; Marchant, Rob; Gil-Romera, Graciela (26 January 2017). "Humans as Agents in the Termination of the African Humid Period". Frontiers of Earth Science. 5 (Quaternary Science, Geomorfology and Paleoenvironment). doi:10.3389/feart.2017.00004. ^ Pasternak, Dov; Schlissel, Arnold (2001). Combating desertification with plants. Springer. p. 20. ISBN 978-0-306-46632-8. ^ Briassoulis, Helen (2005). Policy integration for complex environmental problems: the example of Mediterranean desertification. Ashgate Publishing. p. 161. ISBN 978-0-7546-4243-5. ^ Stringer, Lindsay C.; Dyer, Jen C.; Reed, Mark S.; Dougill, Andrew J.; Twyman, Chasca; Mkwambisi, David (2009). "Adaptations to climate change, drought and desertification: local insights to enhance policy in southern Africa". Environmental Science & Policy. 12 (7): 748–765. doi:10.1016/j.envsci.2009.04.002. ^ Pasternak, D.; Schlissel, Arnold (2012-12-06). Combating Desertification with Plants. Springer Science & Business Media. p. 38. ISBN 9781461513278. ^ Drost, Daniel; Long, Gilbert; Wilson, David; Miller, Bruce; Campbell, William (1 December 1996). "Barriers to Adopting Sustainable Agricultural Practices". Journal of Extension. 34 (6). ^ Briassoulis, Helen (2005). Policy integration for complex environmental problems: the example of Mediterranean desertification. Ashgate Publishing. p. 237. ISBN 978-0-7546-4243-5. ^ For example, Eden Reforestation Projects website, on Vimeo, on Eden Reforestation Projects on YouTube. ^ This article incorporates public domain material from the United States Government document "http://pubs.usgs.gov/gip/deserts/desertification/". ^ "Drylands Restoration Initiative". Food and Agriculture Organization of the United Nations. Retrieved 14 April 2016. ^ Global guidelines for the restoration of degraded forests and landscapes in drylands (PDF). Food and Agriculture Organization of the United Nations. June 2015. ISBN 978-92-5-108912-5. ^ "China's 'Great Green Wall' Fights Expanding Desert". 2017-04-21. ^ Gadzama, Njidda Mamadu (2017). "Attenuation of the effects of desertification through sustainable development of Great Green Wall in the Sahel of Africa". World Journal of Science, Technology and Sustainable Development. 14: 279–289. ^ "Our Good Earth – National Geographic Magazine". Retrieved 21 June 2016. ^ "Home – Justdiggit". Retrieved 21 June 2016. ^ "Département Biologie Végétale – Laboratoire Commun de Microbiologie IRD-ISRA-UCAD". Retrieved 21 June 2016. ^ "Sprouting Trees From the Underground Forest — A Simple Way to Fight Desertification and Climate Change – Water Matters – State of the Planet". Blogs.ei.columbia.edu. 2011-10-18. Retrieved 2012-08-11. ^ a b c "How fences could save the planet". newstatesman.com. January 13, 2011. Retrieved May 5, 2013. ^ Abend, Lisa (January 25, 2010). "How eating grass-fed beef could help fight climate change". time.com. Retrieved May 11, 2013. ^ Briske, D. D. "Origin, Persistence, and Resolution of the Rotational Grazing Debate: Integrating Human Dimensions Into Rangeland Research" (PDF). Rangeland Ecol Manage 64:325–334. Retrieved 6 April 2013. ^ D. D. Briske, J. D. Derner, J. R. Brown, S. D. Fuhlendorf, W. R. Teague, K. M. Havstad, R. L. Gillen, A. J. Ash, W. D. Willms, (2008) Rotational Grazing on Rangelands: Reconciliation of Perception and Experimental Evidence. Rangeland Ecology & Management: January 2008, Vol. 61, No. 1, pp. 3-17. Arnalds, Ólafur; Archer, Steve (2000). Rangeland Desertification. Springer. ISBN 978-0-7923-6071-1. Bauer, Steffan (2007). "Desertification". In Thai, Khi V.; et al. (eds.). Handbook of globalization and the environment. CRC Press. ISBN 978-1-57444-553-4. D’Odorico P., A. Bhattachan, K.F. Davis, S. Ravi, C.W. Runyan, (2013). Global desertification: Drivers and feedbacks, Adv. Water Res., 51, 326-344. Geist, Helmut (2005). The causes and progression of desertification. Ashgate Publishing. ISBN 978-0-7546-4323-4. Hartman, Ingrid (2008). "Desertification". In Philander, S. George (ed.). Encyclopedia of global warming and climate change, Volume 1. SAGE. ISBN 978-1-4129-5878-3. Hinman, C. Wiley; Hinman, Jack W. (1992). The plight and promise of arid land agriculture. Columbia University Press. ISBN 978-0-231-06612-9. Johnson, Pierre Marc; et al., eds. (2006). Governing global desertification: linking environmental degradation, poverty and participation. Ashgate Publishing. ISBN 978-0-7546-4359-3. Mensah, Joseph (2006). "Desertification". In Leonard, Thomas M. (ed.). Encyclopedia of the developing world, Volume 1. Taylor & Francis. ISBN 978-0-415-97662-6. Oliver, John E., ed. (2005). "Desertification". Encyclopedia of world climatology. Springer. ISBN 978-1-4020-3264-6. Parrillo, Vincent N., ed. (2008). "Desertification". Encyclopedia of social problems, Volume 2. SAGE. ISBN 978-1-4129-4165-5. This article incorporates public domain material from the United States Government document "http://pubs.usgs.gov/gip/deserts/desertification/". 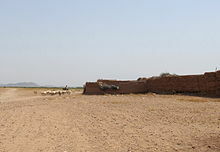 Wikimedia Commons has media related to Desertification. Bell, Trudy; Phillips, Tony (December 6, 2002). "City-swallowing Sand Dunes". NASA. Archived from the original on June 19, 2006. Retrieved 2006-04-28.